One of the very few drawbacks of flying with Emirates surely is the stopover in the desert: even though Dubai’s airport is modern, beautiful and climatized, you still have to wait for your connecting flight – sometimes for multiple hours. 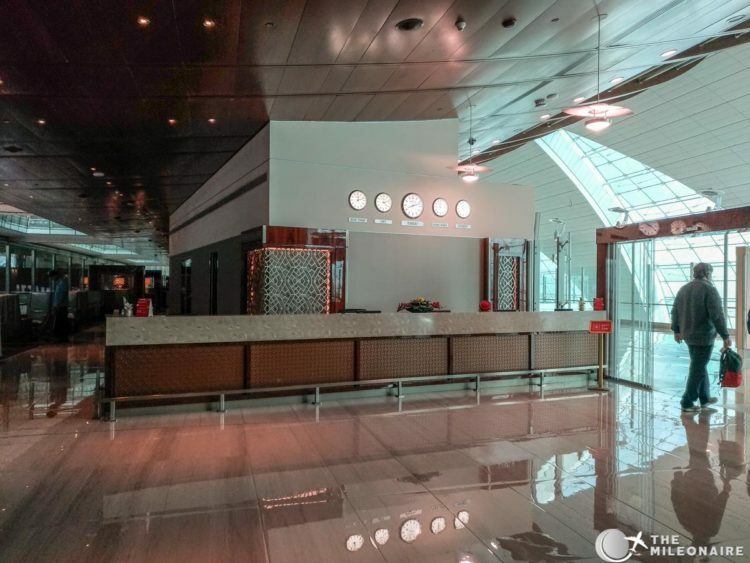 There is a small oasis in the desert though: Emirates’ Business Class Lounge at Dubai Airport, that waits for business passengers in Emirates’ home port! 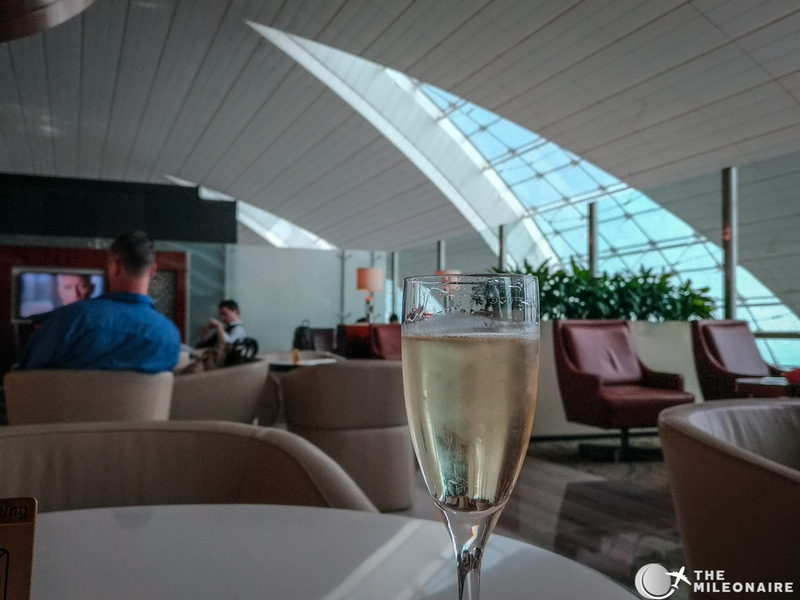 During my last trip to Bangkok I was able to check out Emirates’ Business Class Lounge in Dubai myself, coming in with quite some high expectations. In my following review and photo report I’ll show you if these high expectations were met, missed or even exceeded! 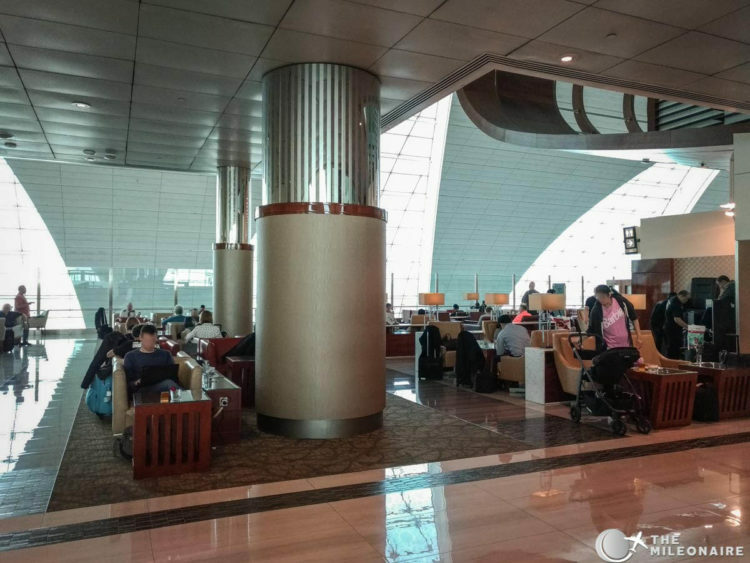 Because of the sheer size of Dubai’s Airport, Emirates operates multiple Business Class Lounges in Dubai. 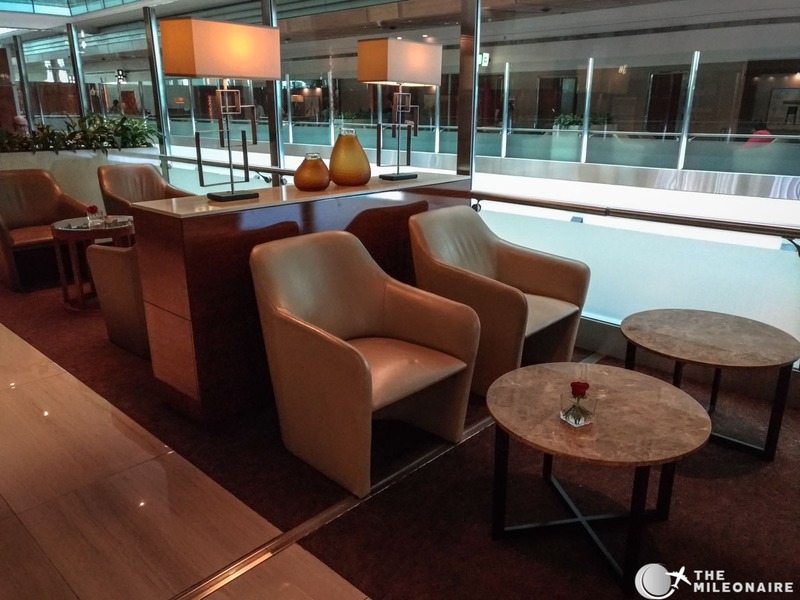 Depending on which gates (A, B or C) you’ll depart from, you’ll be using a different lounge each time. 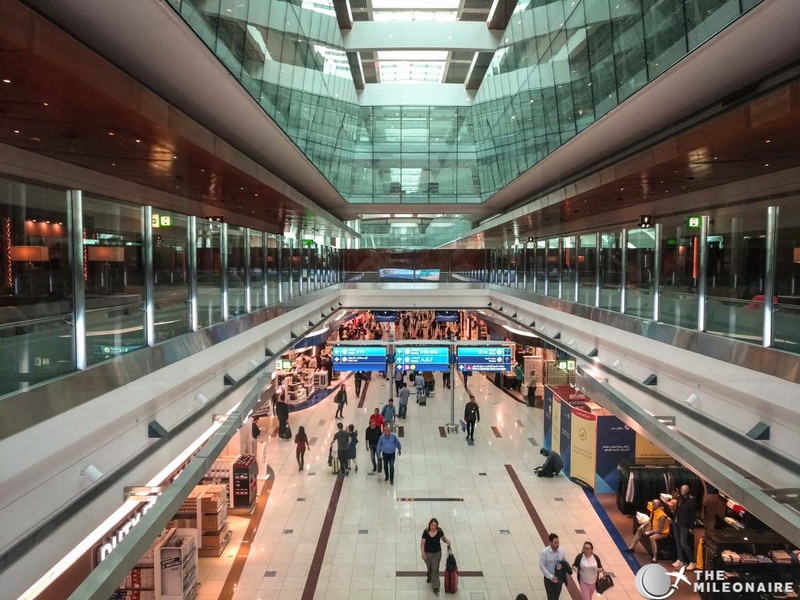 Ideally you always visit the one closest to your gate, as distances in Dubai can be quite long. 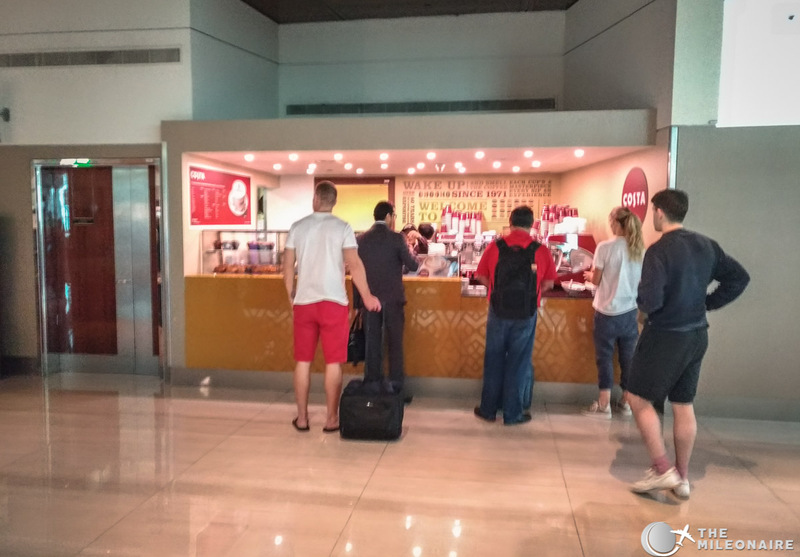 The Emirates lounges are signposted pretty well and are located after security above the actual departure gates. In my case I just had to follow the signs, take an escalator upstairs and head to the Emirates Business Class Lounge on the left. 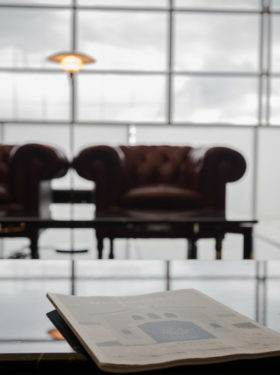 Looking down:Emirates’ Lounge in Dubai overlooks the actual terminal. Lounge Access: Who gets in? 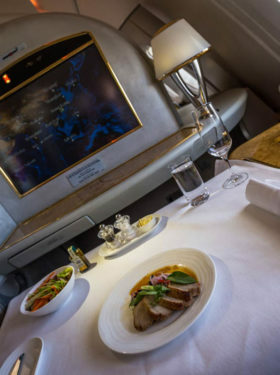 Guests in Business or First Class, departing on an Emirates flight this day. Once you’ve come up the escalator, multiple desks will wait for you to check into the lounge. 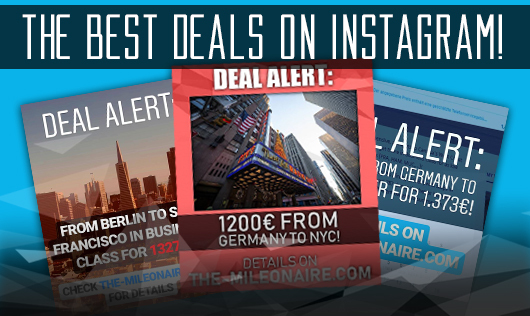 Show your boarding pass, and you’re in! The most important and obvious sight first: the Emirates Lounge in Dubai is HUGE. I’ve seen many lounges over the years, but this one is just insanely large – offering space for more than 1.000 guests at the same time. The lounge is that big that the lounge maps throughout it really make sense and help a lot – some of them even with the walking distance in minutes! A map for a lounge: the Emirates Lounge in Dubai is huge! 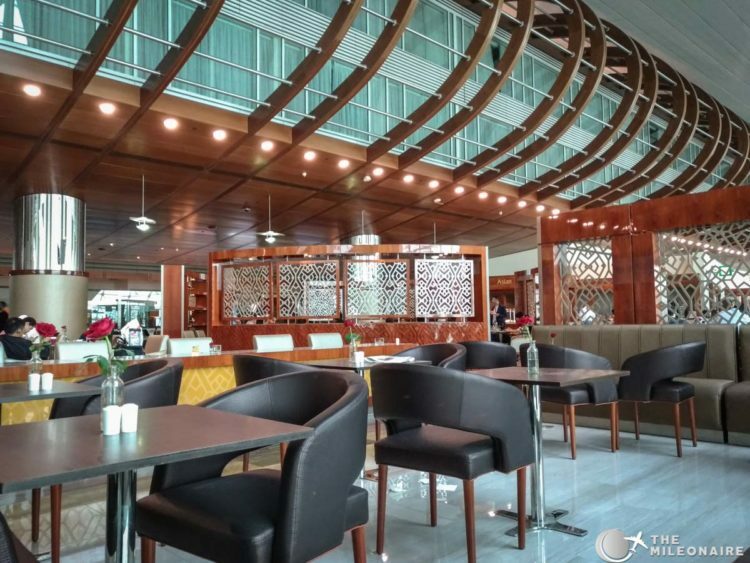 Because of its sheer size, the Emirates Lounge in Dubai offers a huge amount of different seating areas. The first ones near the entrance are a bit larger and less quiet, but are separated from the rest with a couple of dividers (you’ll see lots of them in the lounge). If you’re looking for a quieter space, there are lots of smaller areas with two to four lounge chairs. These chairs are really comfy, and some of them offer a view down on the Terminal below. If you’re tired, there are reclining lounge chairs to relax. If you’re craving for some food, there are proper dinner tables near the different food stations in the lounge. 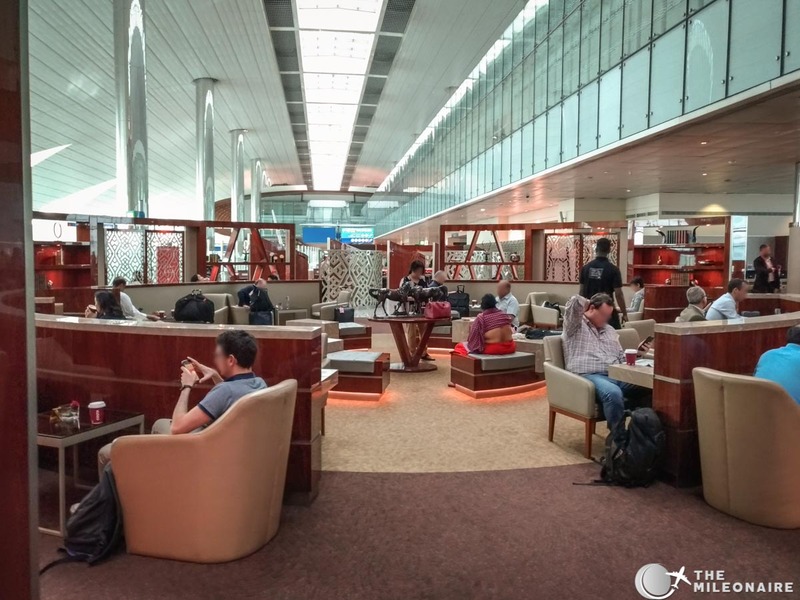 In general I really like Emirates’ Lounge Design in Dubai: Especially the very ‘open’ atmosphere of the area is nice, as the lounge is practically ‘floating’ above the gate area. There is no additional roof besides the airport’s steel hull, which adds a great level of spaciousness on top. You can see the outer wall of the airport in the background. The materials used in the lounge seem classy and consistent with Emirates’ brand design: the beige lounge chairs are like the ones you find in the Emirates Lounge Paris or Bangkok, same goes for the wooden wall panels. Plus, another must-have of Emirates Lounges: the world clocks! 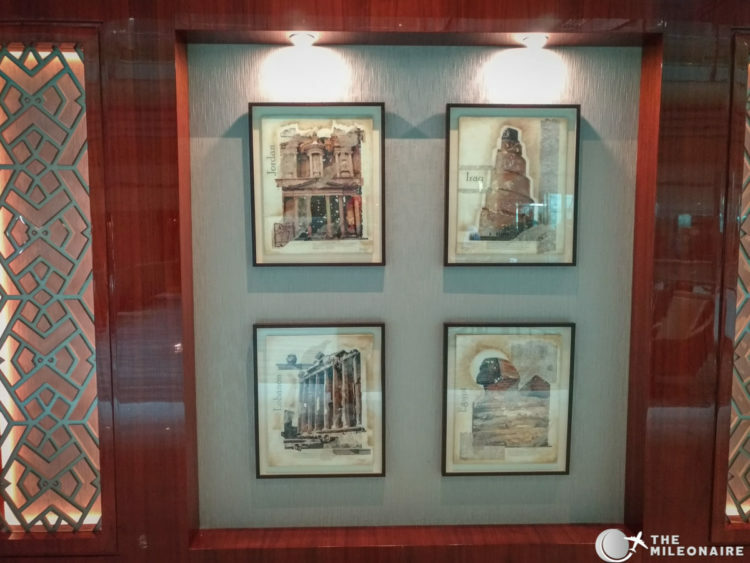 There’s also a nice attention to detail in the lounge: a multitude of beautiful little sculptures, artworks or plants are spread throughout the different areas, and there are drawings of different Emirates destinations everywhere in the lounge. 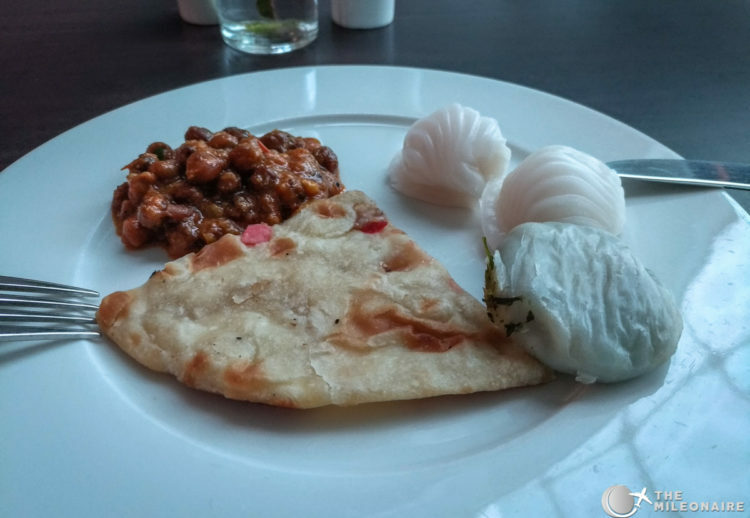 Speaking of food: Emirates offers the most extensive choice of different food offerings throughout the lounge, more than in any other lounge that I have experienced. 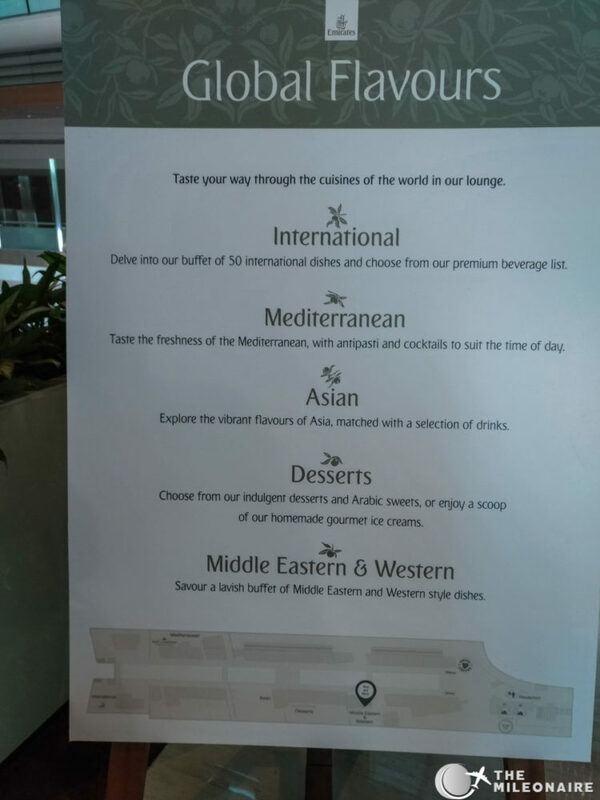 The buffet is divided into five different areas, each of them with a different culinary focus: International, Mediterranean, Asian, Middle Eastern/Western and Desserts. These are spread throughout the lounge and eache of them has its own seating area, so you can always choose exactly what you’re in the mood for. The food was really good with great flavors and just a huge variety of different options. 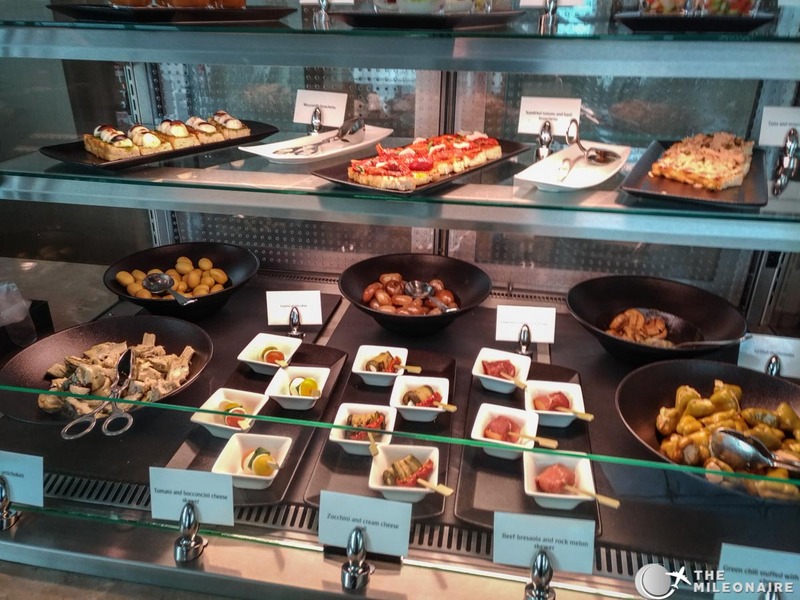 The only drawback is the atmosphere in the buffet areas: as these are huge there’s just so many people around and the noise level rises accordingly. If you’re thirsty the Emirates Lounge in Dubai has you covered as well obviously: there are drinks to be had everywhere, including a good selection of spirits and a variety of softdrinks. 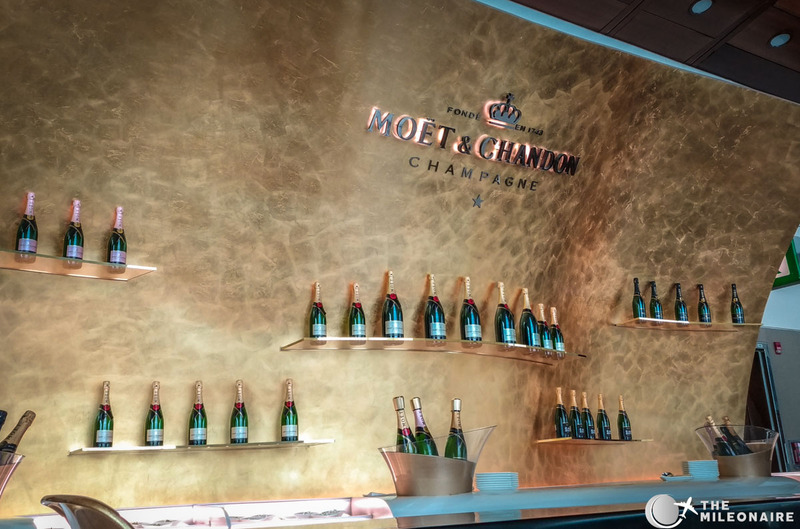 My personal highlight was the ‘Moet Bar’ though: in the very back of the lounge is that wonderful golden place where a bar serves four different types of exquisite Moet champagne (Imperial, Nectar Imperial, 2009, Rose). As I just found my favorite place at Dubai Airport I sat down and had two glasses of my favorite Moet (Nectar Imperial). I could spend hours there: the bar is quiet, the WiFi is fast and the champagne is exceptional. Perfect: a glass of Moet champagne in a very relaxed atmosphere. In addition to the culinary experience there are plenty of other services that the Emirates Lounge Dubai offers: a business center, a quiet relaxation space, a kids area, a smokers’ lounge and a spa with different treatments. 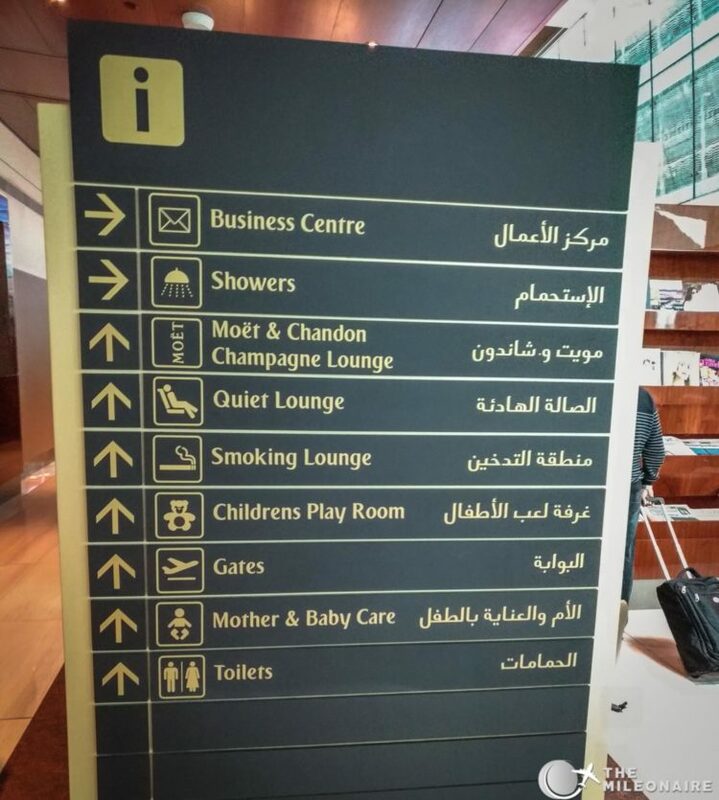 With all these different areas it’s quite good to have so many signs in the lounge showing you the way. I headed for a quick shower before my connecting flight. Shower cabins are located throughout the lounge, but they are nowhere near as spacious or luxurious as the ones e.g. 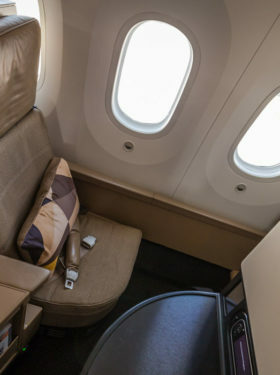 Etihad offers in their main hub: the cabins are small, the shower area is pretty sticky and there’s no toilet included in your cabin. 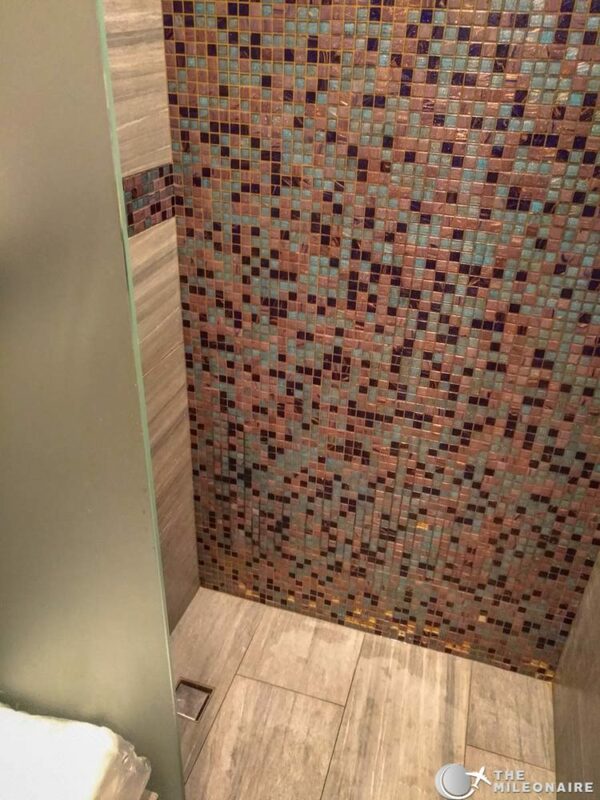 But at least the possibility to take a shower is there. After my shower it was time for boarding already, and with some gates it’s even possible to board directly from the lounge – you just have to take a separate elevator downstairs. The Emirates Business Lounge in Dubai can be summarized with one word: HUGE. Not only because of its size, but also when it comes to the services and food options offered. Despite a stopover of more than two hours it was not possible to explore all the different areas properly. It’s huge, but you can still find quiet areas to relax or even go to the best bar a lounge has to offer and sip some Moet. 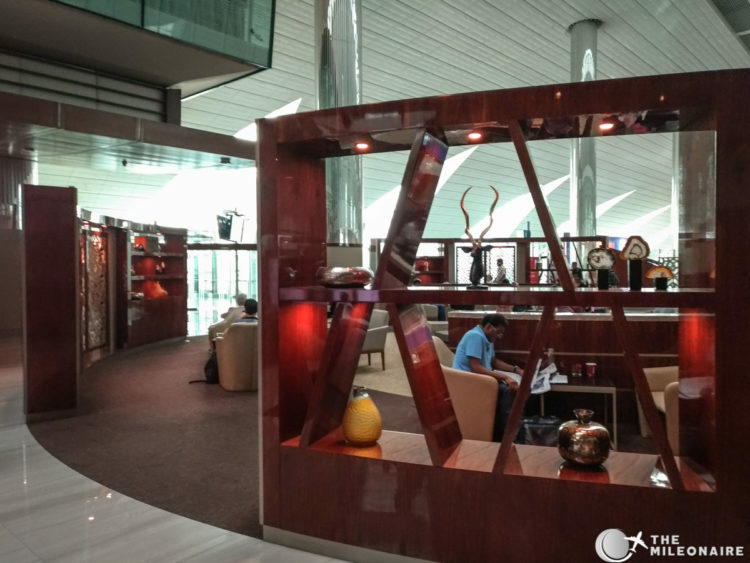 Despite some minor weaknesses the Emirates Business Lounge in Dubai is one of the best business lounges in the industry.